We visited the puppies and our breeder for the first time yesterday. We took some time to meet the parents, played with the three pups for a while, and got some questions answered by our breeder. The mother seemed very mild mannered, but also aloof, which is a common characteristic of Shibas (or so I’ve read). Daddy was very alert, when we made sudden moves he would quickly look up, and sometimes bark, but he also would let us put him and play with him and pet him as well. It was reassuring to meet the parents in person. All three are boys. The two guys on the left were a little standoffish at first, but once the got used to us they played with us. They even let us pick them up and cradle them. The cute guy toward the back right was very shy. He cried a lot and kept trying to run back into his bed when our breeder let them out. He was also very nervous. When we picked him up he shook a lot, but eventually he calmed down. I liked him a lot. Even though he was shy and nervous, he seemed like he just wanted to stand back and observe everything until he felt comfortable. An introvert. I can relate, and I would be lying if I said that a part of me gravitated toward him because I felt bad for the guy. But from the books I read, it seems that if a puppy is already shy as a baby, that is a very bad sign. True? But who knows, maybe he’ll change. They are only 5 weeks old. Our breeder says she is going to keep one of them, but she’s not sure which one yet. She said she will probably keep (one of the boys on the left). This works fine for us. We liked both of those guys and would have happily taken home either one of them if we had to make the decision yesterday. We liked the shy guy toward the back too, but we are hesitant to take him because he is so shy and nervous. Its amazing how at only 5 weeks, each of them already has their own individual qualities/personalities. 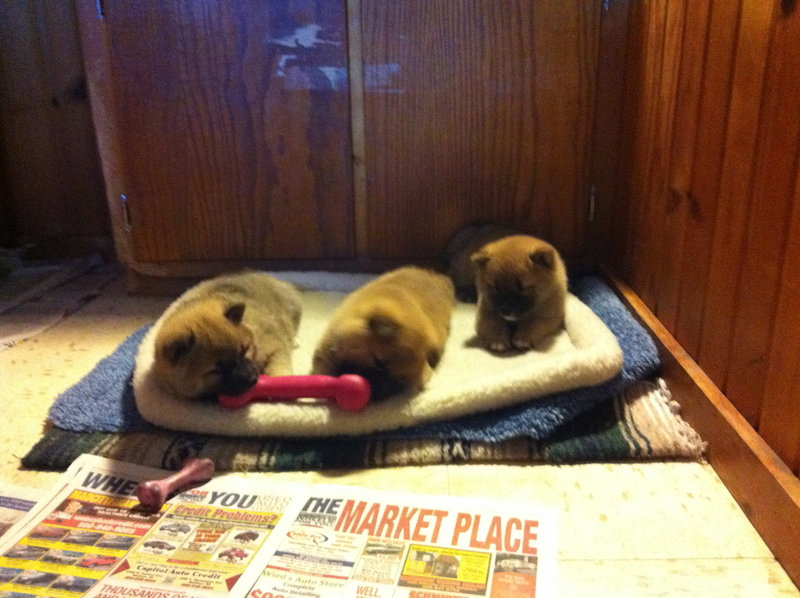 They guy on the far left (puppy 1) is the most outgoing and the chubbiest :-). The pup in the middle (puppy 2) is “the best show-quality” pup and is fairly outgoing. The pup toward the back (puppy 3) is very nervous, has a very soft coat, and will likely have a nice fiery red coat. None of the showed too many dominant characteristics, toward each other or us. Not sure which one we like the best yet. Which one would you choose if you had the choice? Puppy 1, puppy 2, or puppy 3? Our breeder was very helpful! She answered all of our questions and suggested some products to purchase for when the pup comes home. The date is set! Oct 20th 2011 is the day he comes home. Let the countdown begin!! Our breeder is going to keep us posted on their development and also which one she decides to keep. As for now we are leaning toward puppy 1 or puppy 2. But who knows, maybe a lot will change with the pups in the next 3 weeks.